A 20-minute ride on a motorized banca from Barangay Danan, Vincenzo Sagun, Zamboanga del Sur takes you to beautiful Triton Island, with its white sand and cool waters, the pride of this serene and peaceful town. A three-hectare expanse on the island is lush with greenery. ‘‘Balite’’ trees abound in the area, old trees preserved through time and thick vines reminiscent of the days of ‘‘Tarzan’’ jumping from one tree to another. Ever heard of Triton shells? Locals call it ‘‘Bodyong’’ which is used to summon people in the old days and it looks like a trumpet. That is how the beautiful island paradise got its name since the place was so abundant with triton shells. “We have preserved the trees in the island and you must have noticed that these trees are very old. There is a caretaker who watches over the island because some people cut down the trees,’’ Meriline Locson, Municipal Planning and Development Coordinator of V. Sagun who obliged to be our tour guide, said. “Its natural beauty has been preserved for nature lovers who want to trek around the island, enjoy the exhilarating adventure and just have fun. The forested area is ideal for mountain climbing/trekking, and over the side of the island is the underwater cave and the Triton Ocean Park which boasts of fine corals on the very deep seabed frequented by divers from nearby municipalities. Sometimes, it is also referred to as the scuba diving capital and diving paradise of Zamboanga del Sur. Way back in 1992, a marine sanctuary covering 75 hectares was established in partnership with the Muslim Christian Assistance for Rural Development – Community Services for Education and Economic Development (MuCARD-CoSEED), a non-government organization. After 10 years, their efforts paid off and they now enjoy the fruits of their labor. Local folks can fish in a designated area of the marine sanctuary for their consumption but not on a commercial scale. Other agencies involved in the protection of the marine sanctuary are the Department of Environment and Natural Resources, Department of Agriculture, LGU, Bureau of Fisheries and Aquatic Resources, and Philippine National Police. The CAFGU and Bantay Dagat regularly patrol the area. “Having been chosen as a diving area by the DENR, we joined the Scuba Diving Training last February 27-March 2 with 27 participants to upgrade our skills. The training was held here seeing the great potential of the place,” Locson explained. “There are at least seven species of sea turtles and three of them can be found here: Green turtle, Loggerhead, and Hawksbill. DENR has advised us not to put cottages where people will stay long. Turtle watching may be done three days before full moon because they will come ashore to lay their eggs. So, camping and excursion are encouraged before full moon so as not to disturb the turtles,” she said. For two consecutive years, 2009 and 2010, Vincenzo Sagun received the award of being the “Most Peaceful Municipality” in the country. Mayor Edilberto Adlaon attributes this to a very functional Peace and Order Council and an organized Barangay Intelligence Network as well as the vigilance of the local folks, the peace-loving citizens of the town. Vincenzo Sagun used to be a part of Margosatubig, Zamboanga del Sur. It was named after the late Congressman Vincenzo Sagun which was created on February 8, 1983 by virtue of Batas Pambansa 73. 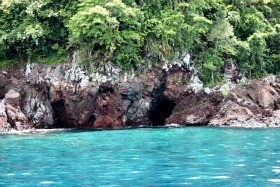 Triton Island is unspoiled, its flawless beauty adding to its mystic existence. It has not been tarnished by modernization nor ruined by time. Nature lovers would find a haven in this place, great for bonding and relaxing with family and friends. With a minimal cost of P25.00, you can reach this island paradise on a motorized banca. Entrance is so affordable, only P10 which is for the upkeep of the place. One must only coordinate with the MPDC or the local government unit to visit the place. “Sometimes, we have foreigners who come here and they always come back for the dives and the corals, sunbathing in the shore, snorkeling, and scuba diving. We have nice, friendly, beautiful, and peace-loving people in Vincenzo Sagun,” Locson concluded.